Gaudi elevator discovered in Palermo Italy? 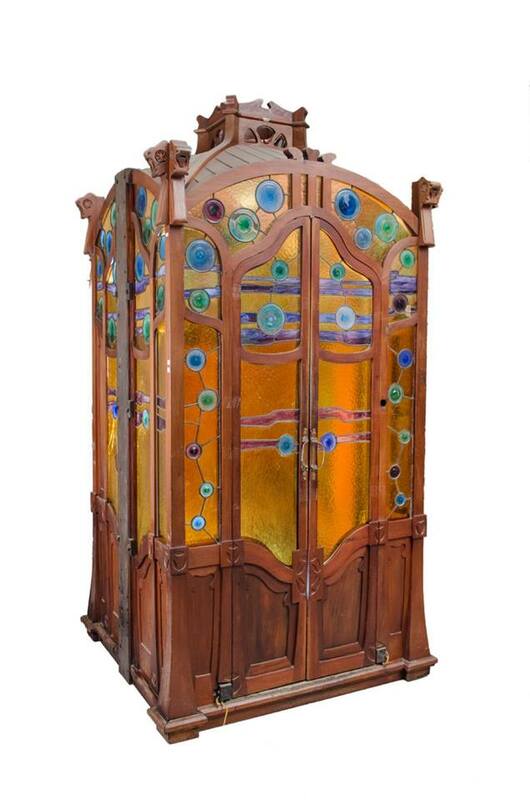 Exciting news this month: Italian Art Nouveau expert Andrea Speziali claims he discovered the elevator cabin that used to be installed in world famous Casa Batlló, Barcelona. Speziali reports that the current owner of the cabin, a wealthy collector from southern Italy, acquired the lift a few months ago from a private holder. He had no idea of the origin of the cabin when he contacted Speziali to obtain his expertise. 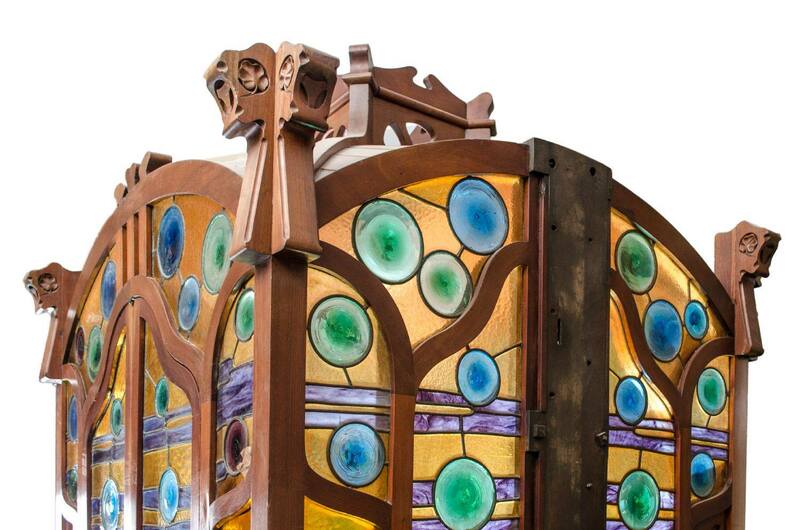 It was then that Speziali made a comprehensive study of a month and a half and viewed thousands of photographs of Catalan Art Nouveau buildings, from Barcelona and all over Spain. 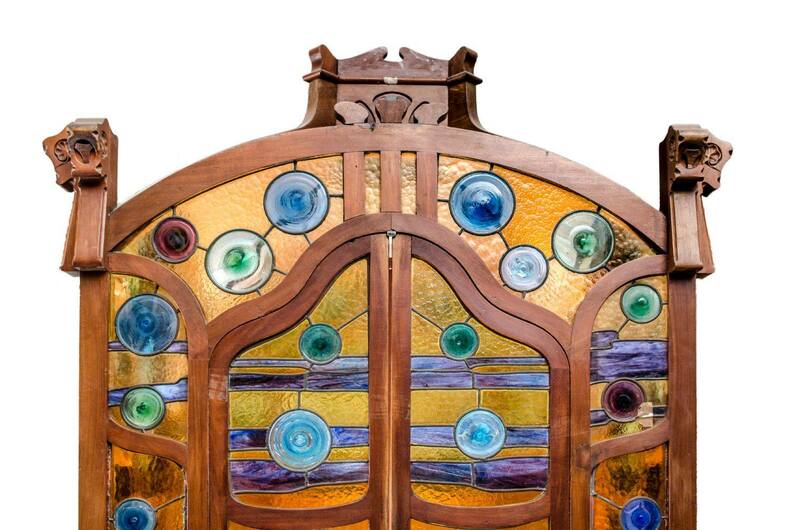 No other house came, stylistically, closer to the design of the cabin than Casa Batlló. 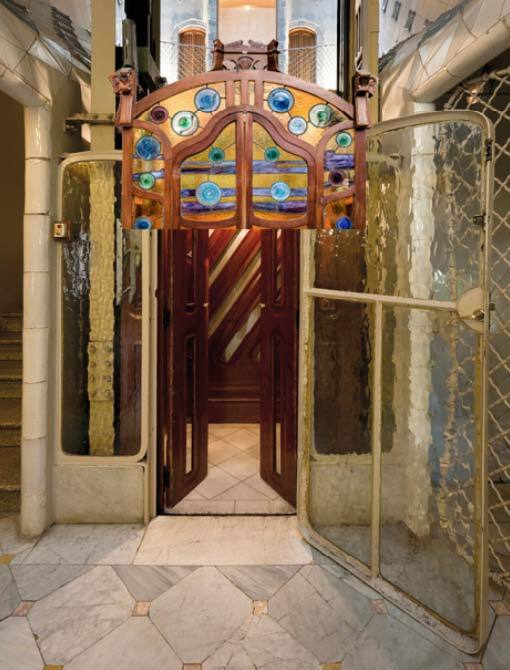 According to Speziali, the materials of this exceptional elevator are reminiscent of the materials used at Casa Batlló; the blown glass, the scenic forms, the colored decorations and the joints appear to be the same as those found at the house designed by Gaudí. He claims the wood (mahogany) and internal flooring of the cabin correspond with the wood used for doors and windows in the building. 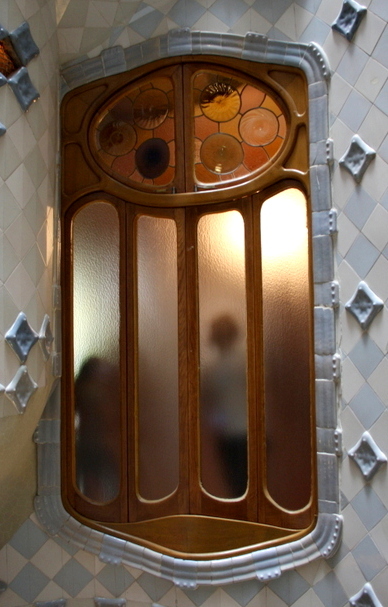 And also the metals employed for the handles of the cabin should be the same as those used at Casa Batlló. Speziali is 100% sure that this cabin comes from Casa Battló, Passeig de Gràcia 43, Barcelona. 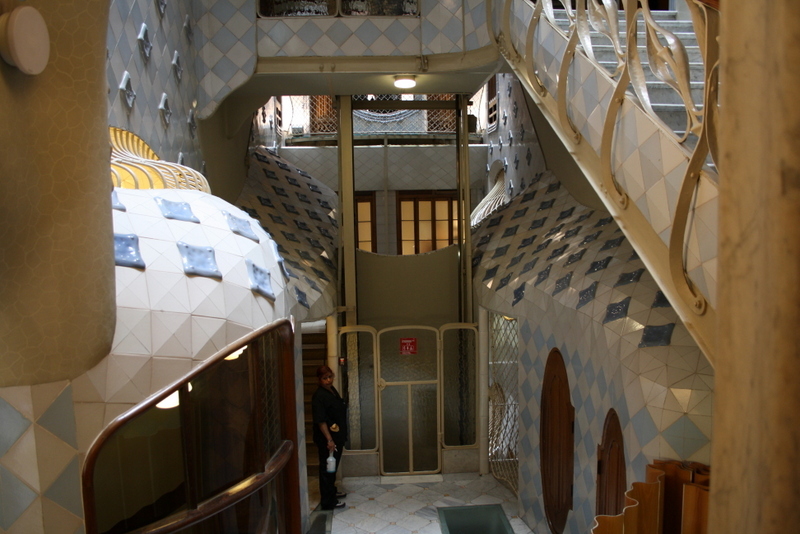 The elevator was built by the Spanish Fuster i Fabra brothers in the style of Casa Batlló. Speziali states that several Italian and Spanish art experts and critics agree with him when he says that Gaudí commissioned the design to Lluís Domènech i Montaner. The Italian expert says that both the outside and the inside of a building, including the elevator, basically always had the same design in those days. And from the above photo we can see what he means. 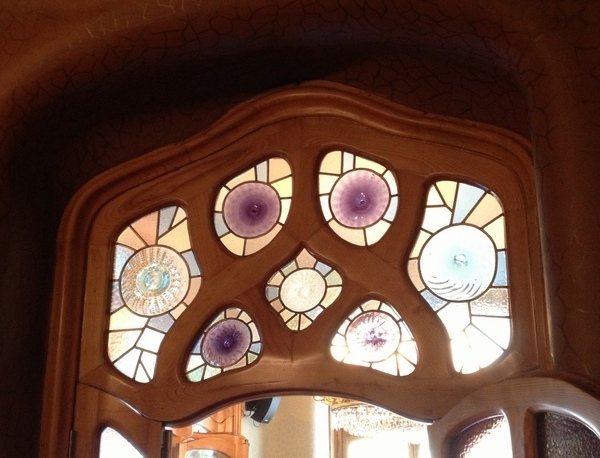 Speziali admits that “although there are many factors leading to Casa Batlló, there is no physical evidence. 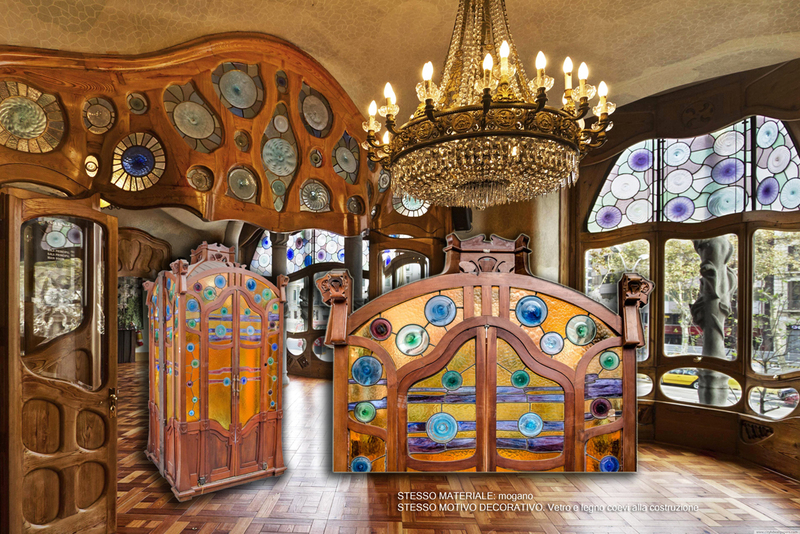 We would need to find a photograph of the elevator when it was installed; but who has such a photograph?” He intends to contact those responsible at Casa Batlló to verify the authenticity of the elevator. Wow! Thank you very much! This is excellent. I will add the itinerary immediately. Do you have other languages as well? Splendid! The more languages the better. Because my readers come from all over the world. Thank you for sharing!